Community Transit conducted a dry run (simulated operations) of Swift BRT on Monday and STB was offered an opportunity to ride. CT is doing final testing and driver training before service begins on Sunday afternoon. I boarded Swift with Community Transit representative Mike Allende at the Airport Road Northbound Station for Everett. The Swift bus pulled in really close to the curb and the doors lined up with markers on the platform called “welcome mats”. This process currently takes about 10 seconds but should be reduced as drivers get used to it. As to why no level boarding? CT considered it but decided to go with a slight step. One reason given was that roadway and vehicle conditions can vary, making it difficult to guarantee a level boarding every time. A fully loaded bus, tire pressure, ruts in the roadway, for example, creates a height difference. Combine that with the expectation of level boarding and people might trip when it isn’t truly level. The bus dwelled for 10 seconds and then we were on our way. Swift will make stops at every station like a light rail train. There are no bell cords but there’s a special request button for wheelchair users. The 62-foot articulated bus has seats for 43 passengers and can carry up to 100 passengers. The Swift bus felt more spacious than Metro’s RapidRide bus. This might have something to do with the seat choice and layout, on-board bike racks, and the color scheme. The New Flyer Advanced-style bus costs $820,000, with 25% of the cost due to the hybrid system. I wasn’t able to get details on the engine and hybrid drive. We arrived at Everett Station but not at the Swift terminal, which still has some work to be done. Mike explained that a shelter’s structural frame can be installed in 2.5 hours, down from an initial 2.5 days. The bus had a brief two-minute break and departed Everett Station at 1:10 pm. Swift buses will depart the terminals on the 10s (:00, :10, :20), making it easy for riders to remember. Our return trip from Everett Station to Airport Road took 20 minutes compared to the estimated 23 minutes. I asked Mike if there are going to be operator reliefs mid-route like Link and he said there shouldn’t be but he didn’t have specifics on how operators are scheduled. If a bus breaks down, a replacement bus would be dispatched as soon as possible. The stops are placed on the far-side of the intersection with enough space for a single bus. This might be a problem if buses begin to bunch up. With only 12 stops each way, speedy boarding and transit signal priority, Swift will save bus riders’ time compared to existing service. 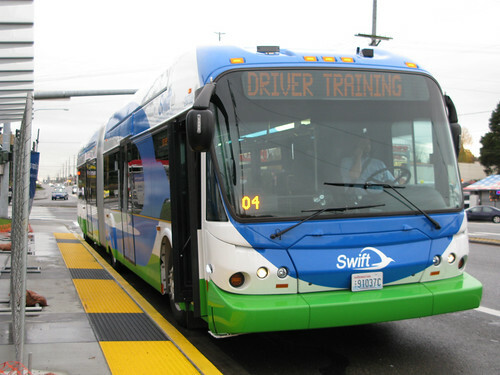 It can take about 75 minutes to travel the entire Swift corridor during off-peak hours, which requires a transfer between CT and Everett Transit buses. Swift simplifies that to a one-seat ride that takes 40–50 minutes. Buses still stop at lights occasionally. What would travel times be if they didn’t? CT figured out that it would take about 32-35 minutes to run end to end without any delays except for making stops at stations during the early and late hours of the day. The City of Everett will add stops at 2 more locations to fill in the wide gaps. The corridor currently carries 4,500 passengers each weekday. There currently isn’t real-time passenger information or automated announcements at the stations or on board the buses. Those amenities are part of Community Transit’s Transit Technology Program which is planned to be operational in 2011. Drivers will announce stops. The sound quality wasn’t very clear and sounded scratchy. A special Swift coordinator will keep in touch with drivers via the radio to maintain even spacing between buses. CT says over 18,000 people boarded Swift buses at public education events during the four months leading to launch. In stockholm they have an automated headway maintenance system on the inner city trunk bus routes. I’m curious is Metro will use an automated system or a manual system. I think it is reasonable to assume that one radio operator with the assistance of a well design TSP system can manage one route but I don’t know about 6 lines. It looks like next few years will be a good year for ATIS in the puget sound region. How does that work? Like a display that tells the driver how many minutes (+/-) they are currently spaced apart from the preceding and following bus? It show the driver how many minutes (+/-) they are from where they should be. The bus that I was on was 3 minutes behind and I have to say that driver wasn’t really making an effort to make up the time. He was actually talking on his cell phone at the time. It is most effective if they are early as where a TSP system that only grants buses priority when they are late is necessary to speed them up. How is payment handled? Do you have to board or exit at the front to pay, or is it a trust-based ORCA system? All payments will be made prior to boarding the coach. The coach has no fare box on-board. Interestingly, the company that CT chose for its TVMs also makes those stupid parking meters located all over Seattle. ORCA’s based on trust? Hah! Get caught without valid fare when a fare inspector asks for it — see if you can use “trust” to talk yourself out of a citation! ORCA is like parking meters: You pay your money because you TRUST that enforcement will catch you if you don’t. If you get caught riding without a fare you should get a citation! Riding without a paying the appropriate fare is illegal. The fine is $124, like on Link. But how would they catch you? If a Swift “ambassador” on the bus comes along and asks to check your fare, you show your ORCA, but he doesn’t know whether you’ve tagged it or not… right? With parking meters, there’s a visual indicator as to whether someone has fed the meter or not. I’d never try to evade the fare (nor promote doing so), but it seems like it would be easy for people carrying an ORCA. The Link fare inspectors have machines that check if ORCA cards have been tagged, so they’re probably in use on Swift as well. There are hand-held Orca readers out there. Most Link fare inspectors, Kitsap Transit foot ferry crews and the How to Ride Swift video all have them. Ah, excellent. I’m glad Swift’s fare enforcement will be more stringent than Metro’s. Thank you both for clarifying. “More stringent” implies a pre-existing condition of stringent-ness. Metro’s fare enforcement is non-existent. I’m going to be pulling those nubs or pushing the button to request a stop. I can’t resist. Level boarding also creates a potential for scratching up the side of the bus. Right after the DSTT re-opened, several Hybrids at East base had lots of damage caused by pulling into the platform too closely. Metro and ST coaches have one advantage in this regard: The bumper is black – not painted – so if you come into the platform carefully, the bumper will hit first and you can pull away with no damage done. Try that with SWIFT’s painted bumpers and wheel covers and you’ll have lots of paint work to do. In short – probably best to not do level loading. For the vast majority of folks, a 6″ step is pretty comfortable. Then again, the DSTT’s level boarding makes that 6″ step easier since you’re not stepping down or up. One quibble I noticed: Does SWIFT have concrete bus pads? If not, I sure hope their stops are reinforced in some way. Buses stopping at precisely the same spot every 10-15 minutes all day is going to create a terrible stress on that pavement. I sure hope SWIFT’s stops don’t end up like many of the older Seattle bus stops – Think of the stop on Olive Way between Terry & 9th Ave.
What about when operators are more than 12″ away from the platform in the DSTT? I think it’s mostly North Base operators that do this, not that I’m picking on anyone. Metro’s guidelines are to position the coaches 6-12 inches from the platform. As for North base operators not getting close enough, well… Assuming your observation is accurate, maybe they don’t get as much practice as Central and East drivers since they only have the 41. Yeah, only 41’s. And I can only think of it at the Southbound Westlake platform. Confused looks from passengers when the platform is… so far away. And I don’t have anything against North Base–I like all operators equally! The last time I drove up there, I thought it was all asphalt. Oran would probably know for sure. How was the ride quality anyways? Other photos I found looked like asphalt with a concrete curb (as in the photo shown with the post). It feels just like a brand new hybrid articulated bus. So of you ride those a lot like I do, you won’t feel anything special about it. I did stand most of the time on the bus and leaned or held on to a handrail. Fewer stops does make for a smoother and more predictable ride. There are signs on the coach reminding passengers to hold on. I am willing to be persuaded, but could someone explain to me why I should be excited about a new bus service? I mean, I get the general idea, expanding transport and all that, but some specifics would be nice. B/c rightnow I am very… meh. * fast loading/unloading. Payment takes a huge amount of time on buses, which makes buses really slow. Moving payment off the bus should speed up service quite a bit. * more doors. Again, for faster loading and less squeezing past others to leave. * high frequency. This is actually easy to do once you speed up a line. A run that’s twice as fast can carry twice as many people and come twice as often. High frequency increases ridership since it all but removes the experience of just missing your bus and having to wait half an hour. Are the Swift buses hybrids? Or straight diesel? Exactly. The “Advanced” package is just a body styling package. Other than the exterior body styling, they’re identical to the 250-some hybrids Metro has. The interior is different because each transit agency picks what they want (and where they want it). 25% of $820,000 sounds like a pretty hefty premium but if KC Metro reports of $100 per hour cost of operation vs more like $130/hr for a conventional bus are true then it pays for it’s self in a little over a year. That’s at 16 hours per day in service. That might be on the high side but even 8 hours a day it pays off relatively early in the expected lifetime service interval. Of course I’m not convinced anybody really has a handle yet on the true lifecycle costs for hybrid buses. Everything is going Hybrid: GE has a hybrid locomotive, Paccar has trucks, most bus manufacturers have them, Caterpillar is building Hybrid trucks and construction equipment, and even Foss Maritime is getting into the act with a hybrid tug boat. The tech is getting more mature by the day and will continue to do so with high fuel prices and improving energy storage technologies. The believe the fancy exterior styling also carries a price premium over a plain DE60LF. Well, its worth noting the GE Hybrid loco is more of a gimmick than anything. No railroads are really interested in it. Most major RR’s just bought 1000-2000 new Tier-III compliant locos, so they’re not in the market for a while. When the hybrid switcher was introduced, railroads shunned it in favor of multiple-small diesel switchers (three 500-hp diesel engines as opposed to 1 1500hp engine) where each individual diesel turns on as demand requires. Random fact, the diesel-electric hybrid has about 2 minutes of battery before they’re fully drained when starting from a stop, but thats enough to help reduce fuel consumption 10-15% compared to the new Evolution Series locos (and 25% fuel savings over a Dash-9 Series). They’re recharged though regenerative braking (dynamic braking). IMO, hybrids are something to be excited about, even if it’s interim technology. These are clean machines – and a pleasure to drive. I was reminded of this tonight when I drove a #36 in a 60 ft. NF Hybrid. Having not driven one for over 6 months – I forgot how pleasant they are to operate – smooth and quiet. And I didn’t have to worry about wires – had forgotten that particular pleasure. I even got to go overe 40 MPH as my base route from Othello station let me go on the freeway. [Hybrids] are clean machines – and a pleasure to drive. They are indeed “clean machines” but from what I’ve read most of this is because of the emissions equipment fitted to the diesel more than a fuel savings from regenerative braking. I also don’t think any of those in use around here use undersize engines and take advantage of a “boost” from the electric drive. That may well be considered “interim technology” as cars like the Prius have made great improvements since first introduced. I read the report on the “fuel cell” buses at Fort Lewis. They are 90% plug-in technology. In other words, a plug in electric that hauls around a fuel cell. That’s not interim technology, that’s government pork. I’d label the current hybrids as “cleaner” technology. Still, from time to time, I’ll follow one out of the base that is smoking pretty badly and then there is the issue of those auxiliary heaters – sometimes they can smoke so badly at startup you think the coach is on fire. No disagreement with Jeff, however – they are great buses to drive. I really hope they prove to be as cost-effective in the long-term as the county is hoping. so all we need to do to bring the etb routes in seattle up to brt standards is make the parking meters near their stops also dispense bus tickets. Let’s do! No meters by most stops though,just downtown. I don’t think the parking pay stations on the street should be modified to dispense bus tickets. It’ll confuse people as the user interface is limited. You’ll have frustrated drivers getting bus tickets and impatient bus riders buying parking. Then you have to deal with interagency coordination. Parking is dealt by the city and transit by the county. I’d rather have machines designed for transit tickets than repurposed parking machines. They cost more but would be easier to use and be more accessible. Number one reason is off-bus payment. If Metro could devise a system to do this system-wide, at least at crowded stops, it would speed the whole system and save millions – I’m sure of it. Hopefully RapidRide technology will work it’s way into the “normal” bus system. The off board ticketing system will not appeal to “runners” that pay cash. While they could easily pay while enroute with on-board payment, the off-board will be forcing them to spend 15-45 seconds at the platform and having to wait 10+ minutes for the next bus (10 minute headways are during peak only). They won’t be waiting for “runners”. They only expect to wait at stations for about 10 seconds. Although you could just hop on without paying and hope you don’t get caught. Yeah also “runners” I would guess tend to be frequent riders and most frequent riders should have an an ORCA pass. I don’t think there are even ORCA readers on Swift. I think payment is entirely off-board like Link. I was just up on the Swift corridor yesterday, there are ORCA readers on the platform, like Link. Any idea how many of the 4,500 passengers currently transfer to/from a Metro bus at Shoreline? having driven the 101, it seems like 4,450 are transfers. they will have a big shock jan 1 when ct no longer gives or accepts transfers. I’ve been pushing ORCA cards for months now. I’m carrying ORCA and Metro’s fare change brochures on every trip I drive now – Starting in a week I’m going to start making announcements when I have full loads. People are going to get sick of listening to me – but better now than in January. I’ve noticed a steady increase in the number of people using ORCA so I think word is getting out. I’m just glad I’m not driving Sound Transit or CT work in January – I get to still accept paper transfers from Metro. I think much of the recent increase in ORCA usage is from company-funded passes. The first week of November on Sounder there were tons of new ORCA users, at least on the run I take north, almost all of them company-funded passes that had just switched from FlexPass to ORCA at annual renewal. we have signs and brochures on all our ct buses, still when i tell people who pay cash about the change, they have no idea. The agencies involved are not making it easy for many to get orca and load it either, buy at ride store or online only? many cash payers do not have computer, let alone a credit card. I suggested to our marketing that they have some customer service people ride the buses and sell preloaded orca cards, i doubt they will want to get out out of the building and onto a bus. low income will be especially hurt by this. ORCA is expanding card retail locations. It’s taking longer than they expected. Beginning new year, three Safeways in Everett are going to be selling and reloading the cards. A bunch of grocery stores in Pierce County already deal with ORCA cards. CT said they will be lenient with fare inspection during the first weeks. They should just give the cards away as promotional material. And again – Metro “solves” this problem by not having any form of fare enforcement whatsoever. fare inspectors will only be on Swift, and we only have 3 of them, from the customer service dept. Only 3? Considering that there will be 12 out of the 15 buses in service at any given time, there’s still a good chance you might get inspected. I got fare checked today on Link and I recognized the inspector. And I’m not a frequent rider. Even without the level boarding, does anyone know if the bus operator can lower the bus to curb level (a la many of Metro’s level floor buses right now)? In a perfect world, a perfect Puget sound world, I would love to see all bus stops have real-time bus information on a reader board, the light rail stops (coming soon), the streetcar stops (oh wait, they do), the monorail stops (not a bad idea)and the ferry terminals (don’t they?). Apparently it was discontinued due to vandalism, among other things. Re: kneeling – good that someone mentioned that. You can have level or near-level boarding. When I drove a low floor NF out of East Base, I did use the kneel function at Park and Rides – which had a high-curb anyway -for darn near level boarding. The other place I used the “kneel” function were the stops in the sticks where the bus stop was planted in gravel level to the roadway – otherwise it was quite a hop up for a passenger. I think CT drivers use kneel all the time on buses so equipped. Must be a policy as I was forever behind those guys downtown on Stewart Street. we will not be kneeling the swift very often, only at aurora village where the curb is not as high as the other swift stations. ct even changed the kneeler to a 2 step switch to discourage us from using it, too much time is wasted and not really needed for such a small step. On the other routes, we almost always kneel but are not required to do so. Well that’s just silly – Kneeling a Metro Hybrid doesn’t take long at all. When I flip the switch to bring the coach back up I use the time to scan mirrors and look for runners – something I should be doing anyway. Increasing the focus on speed risks safety. I like the no waiting for runners though. I’ll go along with Velo – kneeling, particularly at heavy-loading locations like Park and Rides – actually saves time. It also saves time at the places I mentioned earlier – bus stops in the sticks where the marker is basically buried in the ground at road level. It reduced the time it takes folks to step into the bus. Dropping a bus takes about 3 seconds (5 max), ditto raising it back up. I can offer anecdotally that time is easily made up by speeding loading. Not sure about how “no runners” works at CT, but in Metro territory, that runner reaches into his or her pccket for their cell phone as you’re pulling out and calls in a complaint – complete with your bus number – that you shut the door prematurely and didn’t let them on. 3-5 days later, you’re talking to a base chief about the ‘incident’. We do wait for runners and kneel on other routes, but not for Swift service. Swift will not kneel because the curb at the stations is already high(except aurora village where it will kneel). Wow, some spiteful runners you got there Jeff. I’m guilty of being a runner from time to time but I never called in to complain on drivers when I miss my bus, because I realize it’s my own fault. When a Link operator stops for a runner, it can cause the train to miss the signal cascade and creates delays for everyone else. I like how the SeaTac Airport terminal shuttle trains has signs at stations saying “Holding open doors may cause system delay“. I did in fact have 1 complaint a couple of months ago from someone who said that I closed the back door and pulled away before they could get on the bus at 2nd and Pine (West bound). The back doors close pretty slowly, and that zone is wide open away from the buildings (not like you can’t see passengers waiting in the zone). So what likely happened is that I stopped to let passengers off there, opening both doors, did my mirror check on the right then moved my attention to the left (there’s a switch, a lane change, and a left turn right after that zone – not to mention taxis, horse and carriage riders, etc.). The bus won’t even move until the back door is closed because that releases the rear brake. So yeah – someone came running up to the bus at the last minute and called in a complaint as I pulled away. This is fairly common, particularly at Atlantic base – where I’ve now had three complaints, more than in the entire previous year driving at Ryerson and East base, where I had none. Complaint #2: A customer boarded shouting obscenities to a customer service representative into her cell phone. I asked as she boarded if she would finish her conversation before boarding. She shot me a dirty look, told me to go to hell, and continued conversation as she sat down. As we left the zone, other passengers were demanding she be removed. At 3rd and Union, I again asked her to leave the bus, and she again (vocally and profanely) refused. I hit my PRT to contact the coordinator and told her I was summoning security. Before the coordinator responded, she got of the bus, swore at me telling me I was making her late for work, and told me she planned to get me fired. Her complaint: “driver was rude, forced me off the bus for no reason. Driver should be fired.” Luckily another passenger had called in their own comment on the same incident – backing up my security incident report nearly word for word. Others have threatened to complain – including a “runner” who always dashes to catch my bus at 1st and Denny, which she rides for 2 blocks, getting off at Key Arena. She complained that I pulled away without waiting for her. Her connecting bus is actualy 4 minutes behind my scheduled leave time from that time point, so if she does manage to catch me there, it’s because I’m running 4 or more minutes late. No other real complaints this shakeup, so far. Oh – I did have one last shakeup. A regular non-payer who verbally abused me as they left the bus without paying at Harborview, usually with an “f-you”. I told that passenger he should thank the others on board for paying his fare for him. Someone else (not him, some officious type who lectured me on the way out) called it in, and I got in trouble for “belittling” a passenger. Like I’ve said – no fare enforcement on Metro. We’re not even allowed to mention it. Not sure if this has anything to do with complaining riders but we get similar things in the fast food business. At our store on Capitol Hill located near Broadway & John, we get quite a few people who threaten to call corporate or the police because they didn’t get what they wanted and we refused because they were trying to take advantage of us or get something for nothing. But most of that are just threats, corporate is pretty toothless to begin with and police that he/she called escorted the caller himself off our premises. We have people trying to get “free” water, “free” food, ask for extra stuff that costs more for free, can’t read coupons, and asking to use the restrooms without buying anything (bus drivers and construction workers are welcome). Drunk people and people on drugs who want to use the restroom. People who camp in the store without buying anything or bringing other outside food to eat. They forgot to mention “in front of”. You would think that would be common sense or something your parents taught you. Or that person was suicidal. That’s one reason bus stops are placed on the far side of intersections. It reduces the chance someone would try to cross in front of a bus but it isn’t fool-proof. Trust us, it’s not “Common sense”. I yelled very loudly at the first person who ran in front of my bus *from the street side out of my blind spot* because she startled me. Now I just wait until they are safely on the sidewalk and drive away because frankly, I’m in no mood to explain to them that one mistake on my part leads to them being crushed by my bus and me looking for another line of work. Nobody boards my bus after recklessly putting their life at risk – especially if my bus is the potential instrument of their death – I used to politely explain why but usually I just got flipped off. So now, I just drive away. Kudos for Metro for trying, but I think it’s kind of a hopeless battle. I’ve had people run across a street of busy traffic, mid-block at 3rd and Union, dodging cars as they jaywalked to step in front of my bus holding out their hand as if it were projecting some kind of bus-stopping force-field. Luckily they were partially right – thanks to my Skecher work boots and a steady press on the air brake pedal. Had one woman cross in front of my moving bus from the left while she talked on her cell phone – it held to her head with her left hand, her right hand shoved palm up at me to make sure I stopped and waited for her. So. . .”common sense”? Yeah, you’d think. Oh – and “bus stop”? What’s a “bus stop”? No, not a semantic difference. My ironic point is that there are folks out there who try and wave buses down like they were cabs in the middle of the block, people who stand at “no parking” signs thinking they’re stops, people who approach and knock on your door when you’re in the middle of the street, at intersections, etc. That old “common sense” thingy. What is the ridership projection on this route? What is the minimum headway they could have on this route? I’m guess the infill stations you are talking about are at Madison-Pecks and Evergreen. Did you get any information as to when those stations would be added by the City of Everett? I didn’t get a specific time frame but I’m guessing in about a year. The 62-foot articulated bus has seats for 43 passengers and can carry up to 100 passengers. The Swift bus felt more spacious than Metro’s RapidRide bus. Don’t the standard (not RapidRide) New Flyer articulateds seat 58? Do you just lose 15 seats because of the extra door or did they consciously choose more open space with the idea these routes would be standing room only much of the day? I guess the other possibility is they figure with 10 minute headways there should be less than 43 people needing seats. But then, a 40′ Gillig can seat 45. So it seems a bit odd to run an articulated bus that’s half again as long and seats less people unless your planning to needed the standing capacity. You lose extra seating because the wheel wells on the low floor hybrids extend inside the passenger compartment. In high-floor models, the wheels ride underneath the seating. Low-floor layout doesn’t allow for seats atop the wheels, at least in front. Mid-fuselage they ride parallel to the walls instead of perpendicular, reducing the number of available seats there also. The conversion from high floor to low floor loses 6 seats but I think Bernie was comparing between the BRT and standard low-floor articulated coaches. Metro’s original fleet of DE60LFs from 2004 seat 58. The newer DE60LFs received in 2008 and 09 have 56 seats. They took two seats out of the articulated joint. On the RapidRide coach you lose another six seats due to the extra door and to create a wider aisle at that door well for a total of 50 seats. Swift lost 4 seats due to the middle door, 5-7 seats to make room for the on-board bike racks, and 4 from the articulated joint replaced by stanchions. Having a wide open design facilitates quick loading and unloading. Even the bike racks are designed for speed, just roll on and roll off. Maybe the increased frequency would reduce seat demand. I had no trouble standing for half the route so some might opt to stand for shorter rides. I don’t think that the BRT buses have seating in the articulated/diaphragm area. I also think they may be designed to be wheelchair accessible from the rear of the coach as well as the front. I’ve been on the prototype coach 6000 and there’s a seat on each side of the articulated area like the 6800s. If Metro removed the seats in that area in the later delivered coaches then good for them. That’s not a good place for seats because people seated there easily block the aisle. I saw one at the Monroe fair that didn’t have them – had hand rails instead. Metro (New Flyer and Breda) still have them. To clear any potential confusion: Coach 6000 is Metro’s BRT prototype New Flyer bus, put on display during APTA. At least 15 of them are now at Metro’s South Base. The 6800s are Metro’s New Flyer low-floor hybrid articulated buses that went into service in 2008 and 2009, also running on routes from South Base. The bus you saw at the Monroe fair would be a Swift bus which have hand rails instead of seats in the bendy section. That’d explain. My bad for the confusion – thanks for clarifying.